Education is a passport and a good key for a brighter future. Without knowledge, you can never gain power! Hence, everyone needs to have education to improve life in many aspects. Perhaps, founders of educational institutions understand this concept and have established schools of different education levels. These days, public and private institutions offer education to as young as 3 years old. Thinking that they ought to start molding the minds of children early so they can learn more about how to be independent. Well, with the emergence of online businesses, the education industry didn’t miss to adapt to this powerful change. Thus, you can find various online education websites that offer services across the web. If you’re an entrepreneur looking for the perfect theme for your elementary school website, you should check out these elementary school WordPress themes. Elementary schools or primary schools is where children learn how to write and read. Children in this stage should develop their cognitive, social, emotional, cultural and physical skills. In order to spread awareness of private institutions, a good website will truly make a big difference. Hence, people would know how you value true education, what kind of teacher staff you have, what facilities their children can enjoy as they enroll at your school. All of these can be displayed on your educational website. On the other hand, online courses are also popular these days. We find different websites that offer services to inform, educate, and train. Well, why not check out these elementary school WordPress themes for an effective and user-friendly website. 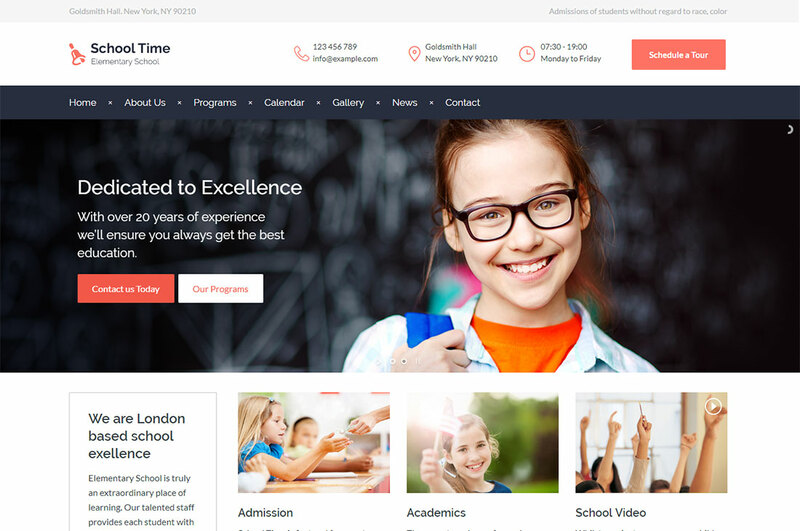 Grab the finest theme that meets your needs in this list and start managing a school website with ease. Education is an essential tool for achieving goals in life. If you plan to build an elementary school website, you probably need to consider Bridge. It’s a multipurpose WordPress theme with massive 376+ demos all essential for building an online presence. Bridge is built with mobile optimization in mind. Therefore, your website is accessible and looks exceptional in mobile devices and tablets. Bridge has a well-designed website for the elementary school. As it is integrated with WPBakery Page Builder, you can complete the elements and layout of your site with ease. The top-notch features of Bridge make the theme worth every penny. Setting up your website with this theme is as easy as counting 1-2-3! Bridge contains most of the elements needed to carefully manage a school or education website. You can find in this theme pages for courses you offer online and its corresponding rates. You may also exhibit the instructors in your school, pricing tables for different plans you offer and events that students or visitors can attend. Building an education website for elementary school has never been easy when you use WordPress theme. Here’s Kallyas, a multipurpose theme we’ve included in these elementary school WordPress themes. Kallyas has 60+ demos that you can install in just one click. 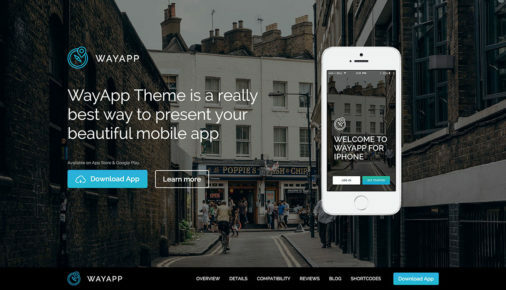 This theme is lightweight, fully responsive, and has smooth animations. Having Kallyas as your theme, you can set up classes online without hassle. Potential students can take the course with the simple interface and appropriate details to enroll with a certain course. You may also set schedules of classes easily as this theme is fully compatible with the Events Calendar plugin. Meanwhile, Kallyas is also integrated with the bbPress plugin for setting up discussion forums within your website. With this plugin, your forums will never be slow and bloated as it focuses on ease of use and speed. When it comes to displaying services, Kallyas lets you present it with style. You can actually organize elements according to your preferences. You just have to drag and drop and they all function well with your own designs. It also has appropriate call-to-action that helps persuade visitors to enroll or inquire of your services. Education plays a great role in the development of man’s life. Without it, one could hardly read and write. If you want to create a simple yet informative website for your elementary school institution, you should check out Kalium. Kalium is a multipurpose WordPress theme packed with premade full demo concepts. The education concept lets you showcase your services to your potential students. It also comes with a news page where you can publish useful and informative articles without hassle. You may also exhibit the courses and seminars you offer and their details. Kalium makes use of a parallax background on the hero. As it is the one that captivates the visitor’s attention, you should grab the high-quality images you will add there, include a compelling tag line and an irresistible call-to-action button. This way, you lead visitors to do a certain action. Putting up a website in the past is not just time-consuming but is also tedious. But thanks to WordPress, setting up a site for any niche is just a matter of clicks. 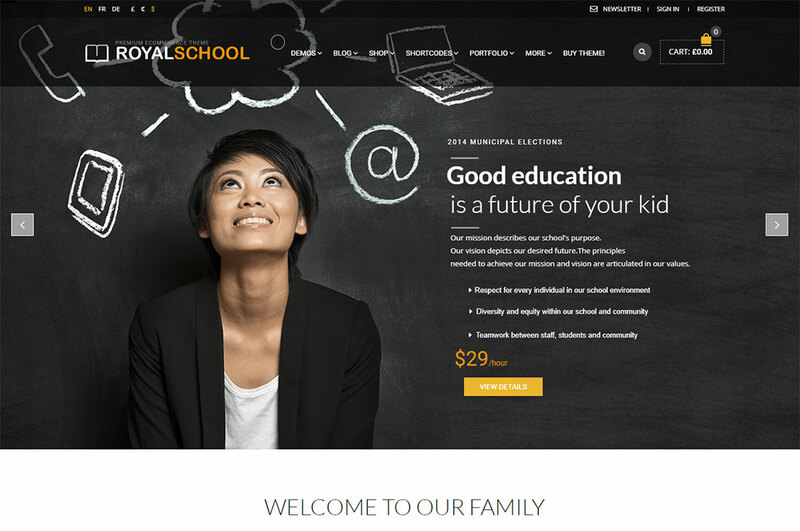 Here’s Royal, a multipurpose theme that we’ve added in this collection of elementary school WordPress themes. Royal Has a professional, elegant and versatile design of prebuilt sites. It has various features useful for website building. The user-friendly and elegant looking sliders also add beauty to your website. Royal is WooCommerce plugin ready so if you plan to sell ebooks, implement subscription plans or any type of monetization is easy to implement. It also comes with mega menus that allows you to add many levels or categories of your site. With such type of navigation, users will find it easy to navigate within your site. The theme is fully compatible with bbPress. Therefore, you can build a cool and awesome forum within your site without the need to hire developers. Education plays a vital role in the development of one’s overall being. 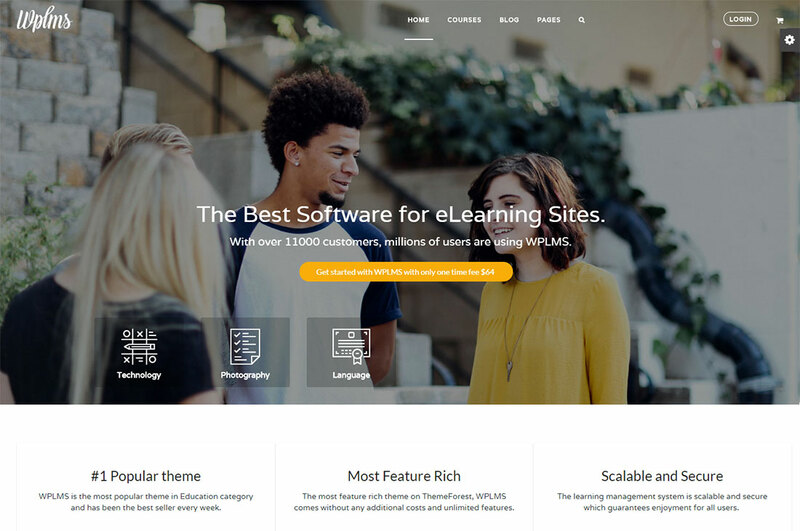 Perhaps developers of WPLMS understand the need for an education theme to boosts online presence of schools, universities, online courses and other related websites. 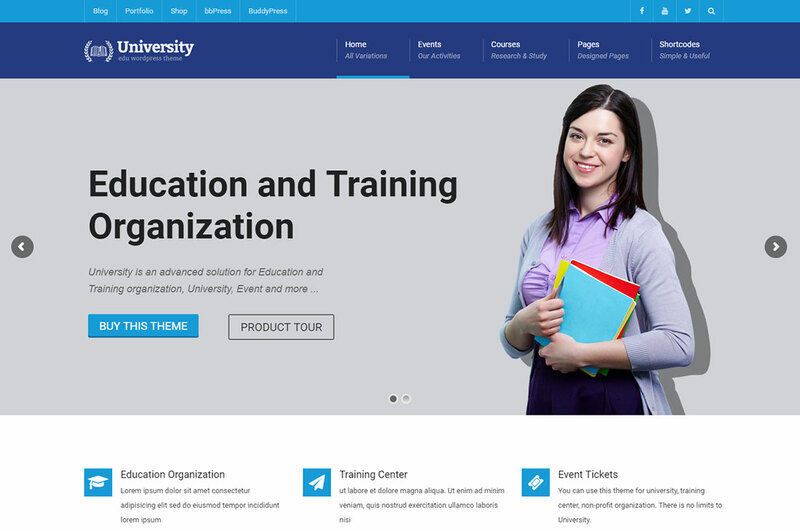 This theme is built for educational training centers, corporate training, course tutor, college, elementary school, etc. It has the most advanced learning management system along with features packed for education websites. In order to perform well, WPLMS is built with compatibility with the powerful WordPress plugins. Basically, it supports Events Calendar for organizing events within your site. If ever you plan to sell items in your site, that wouldn’t be an issue with WPLMS as it’s fully compatible with WooCommerce plugin. The WPBakery Page Builder plugin embedded in this theme will give you an excellent way to finish your pages with your own preferences. Moreover, the theme fully supports bbPress and BuddyPress plugins for a seamless forum and groups in your site. Experience is the best teacher! Indeed! 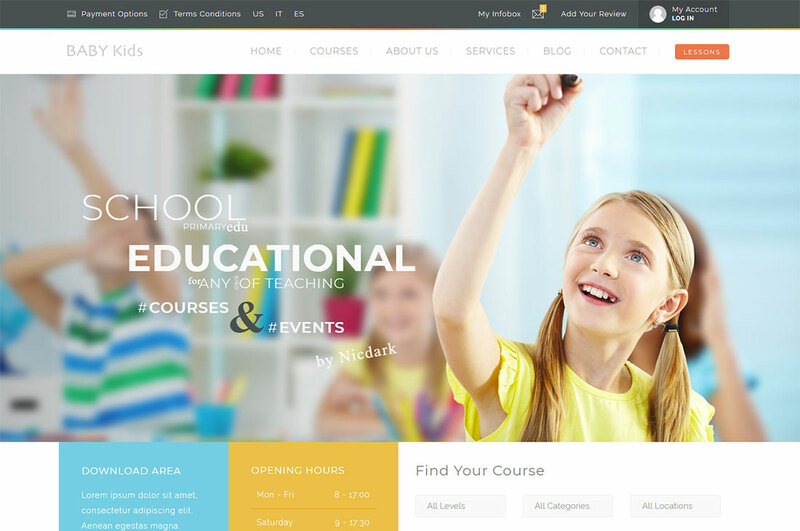 Education WP is built based on the experience of the developers of this theme. Hence, Education WP is a product of keen observation, excellent planning, creativity, and innovation. This is crafted to provide a complete solution to education websites’ needs. 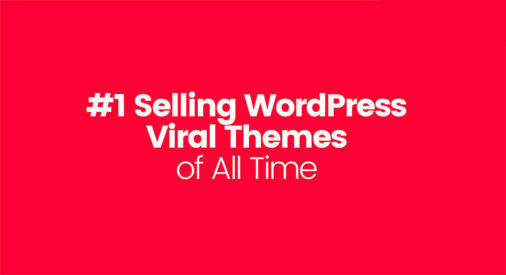 It’s a feature-rich theme packed with the most useful WordPress plugins. Apparently, Education WP has 16 ready-to-use demos for your education website. It’s developed using the most popular LMS plugin, LearnPress. Its user-friendly interface and eLearning features can make the site in demand! Education WP is not just perfect for online courses showcase but allows you to sell courses directly with the WooCommerce plugin too. It uses 5 different payment methods such as PayPal, Stripe, 2Checkout and Authorize.net and Offline Payment. In addition, if you prefer subscription or membership, it’s easier to implement as this theme is integrated with Paid Membership Pro. As Education WP utilizes LearnPress’s add-on bundle, you can easily manage the commission rate for each course. With such features, you can create sites similar to Udemy, Lynda or Coursera. That’s not all, building a learning community within your site is much possible. Education opens greater opportunities and helps people work better. Since most businesses, private and public institutions build an online presence, there’s no reason why should not. So, pick from these elementary school WordPress themes to put up the finest educational websites. School Time is a modern educational theme designed for elementary, high schools and colleges. The theme can be installed quickly with just one click. Thus, you can speed up the development process by 100% and operate the soonest. School Time has 4 demos that you can choose from. Specifically, the theme offers limited color options so you can set it to your business color scheme. Basically, School Time is perfectly compatible with Event Calendar, a plugin that lets you create and manage events seamlessly. With this theme, visitors can easily find events on your site by filtering the date and keyword. Visitors may also view the events via a list, month or day. With this theme, you may also add profiles for your staff and tutors, along with the description, photo, contact details, and more. Create a professional, mobile-ready, fully functional school website using elementary school WordPress themes. Here’s Primary, a beautiful WordPress theme ideal for child care centers, preschool and kindergartens. It’s equipped with premium plugins promising a seamless, innovative and friendly UI. Since mobile devices are one of the great sources of traffic, Primary is crafted with the mobile-first design. Apart from that, sliders are also responsive – works well on different devices such as tablets and smartphones. For managing events, the theme is integrated with Event Management. As it is important for your business to gain revenue, Primary lets you sell tickets with ease. And that is made possible with the powerful and popular eCommerce plugin, WooCommerce. In addition, you can sell courses or let visitors enroll in your site using the same plugin. Once you’ve finished adding compelling contents into your site, you can then make your site live. Well, Primary never miss considering SEO optimization. The theme is fully compatible with SEO plugins like Yoast. Therefore, the search engine would definitely love your website. The advanced web technologies today greatly speeds up the website development process. Let Baby Kids help you with your goal in building websites for elementary school, high school or similar sites. It comes with premium plugins, that boosts your site’s performance that all comes for free! The Slider Revolution lets you create amazing and fully responsive sliders in no time! Thus, your content will look seamless and innovative. You may insert images and videos in the sliders so they smoothly slide or fade. The theme is also integrated with WooCommerce plugin. Therefore, you can easily sell services, tutorials, courses and educational packages. The Baby Kids powerful and advanced theme options give you the possibility to customize all the sections of your website. Moreover, it offers unlimited color options so you can utilize your business’ color scheme. Meanwhile, the blog section will give you the chance to display your articles with style. Also, you may display courses where visitors can view details, read feedback, see teachers For certain courses and more. Most establishments these days have websites to represent their brand across the world. And most of these businesses have reaped what they sow. These elementary school WordPress themes we’ve handpicked will give you ease in finding the best theme. 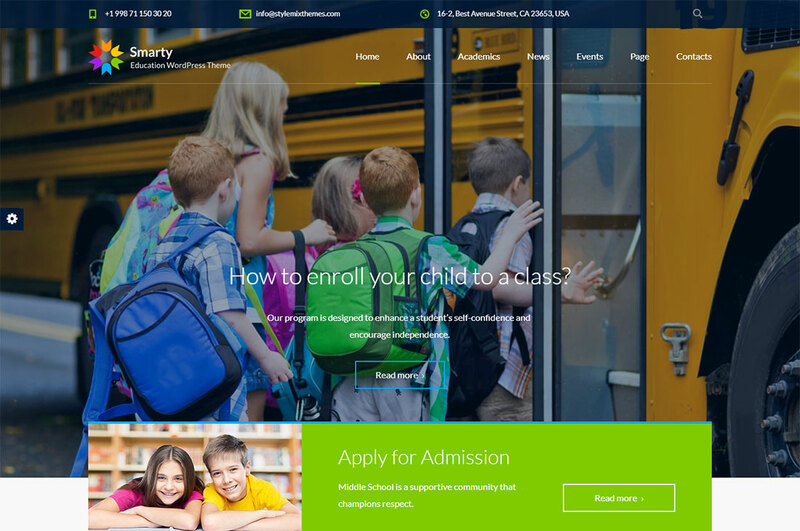 Here’s Smarty, an education WordPress theme perfect for kindergarten, school, high school, college, university and similar websites. It contains 3 intuitive demos that can be installed with ease. Smarty is a responsive theme allowing visitors to access your website through mobile, tablets and other devices. The theme has a live customizer that lets you customize the header, layout and color scheme. Hence, editing the look and feel of your site is just a click away. With this theme, managing your business has never been this easy. The theme lets you add school teachers and assign the classes. Within the classes, you can indicate assignments. Moreover, Smarty also has the events page and the donations page which is linked to PayPal as a payment method. This theme implements a timetable where students and parents can view schedules for a week or for a month. 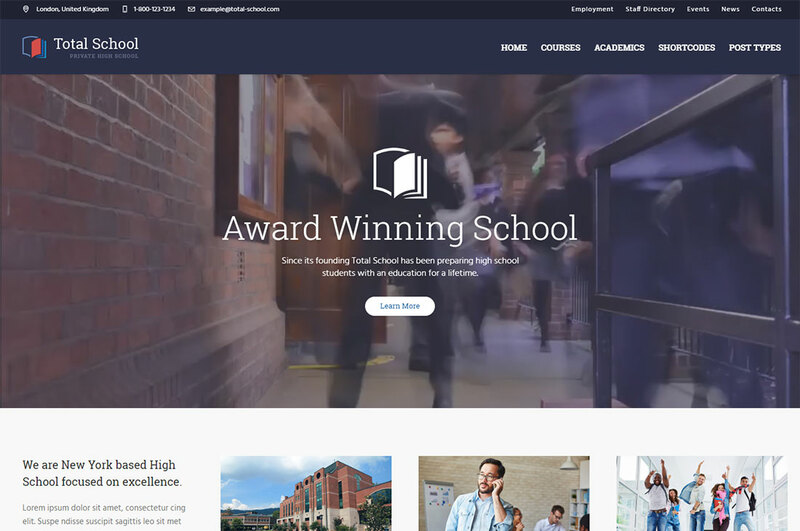 If you don’t have much idea for the content, you can use the predesigned content pages such as admissions, alumni, athletics, cafeteria, summer camps and more. Build your education website with Kingster and let the quality of education spread across nations. 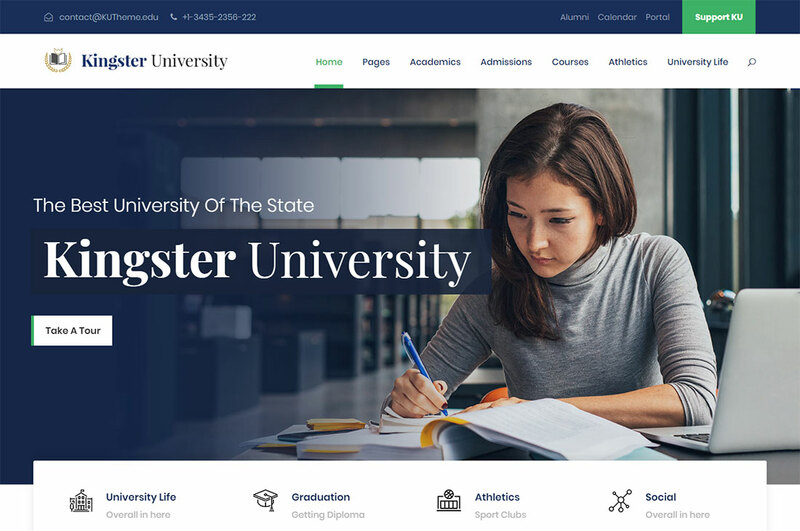 Kingster is an education WordPress theme built for university, college and school. It has the functions, features and elements you need to fully build an education website. It has 2 demos that can be imported with just one click. Then, you can start adding your own contents into the site. Kingster has the most important pages an education website should have. These pages include alumni for encouraging students to become leaders or successful entrepreneurs, etc. Faculty to display instructors, curriculum, donations page and more. 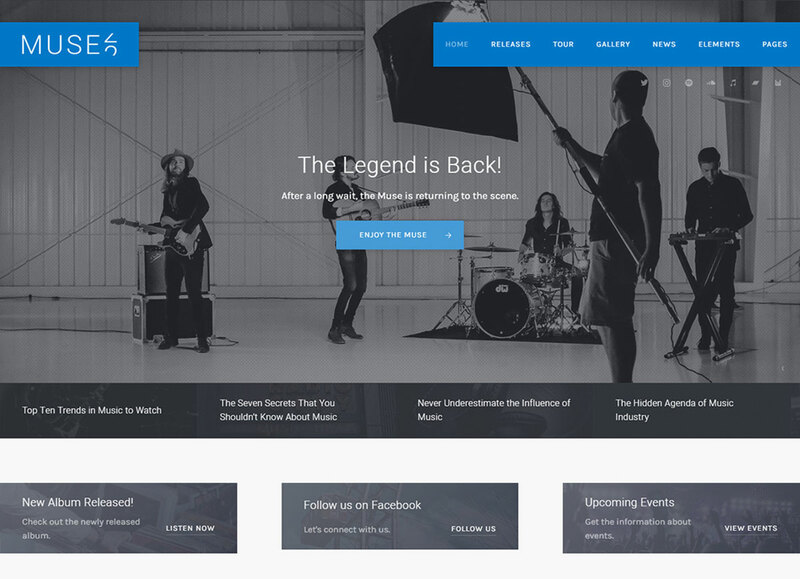 The theme comes with 14 blog layouts, 9 portfolios layouts, 6 gallery layouts 19 header styles and more. With such elements, you can have unlimited possibilities to build your website uniquely. Setting up your website for school websites is a bit complicated. But not when you pick from these elementary school WordPress themes we’ve collected for you. 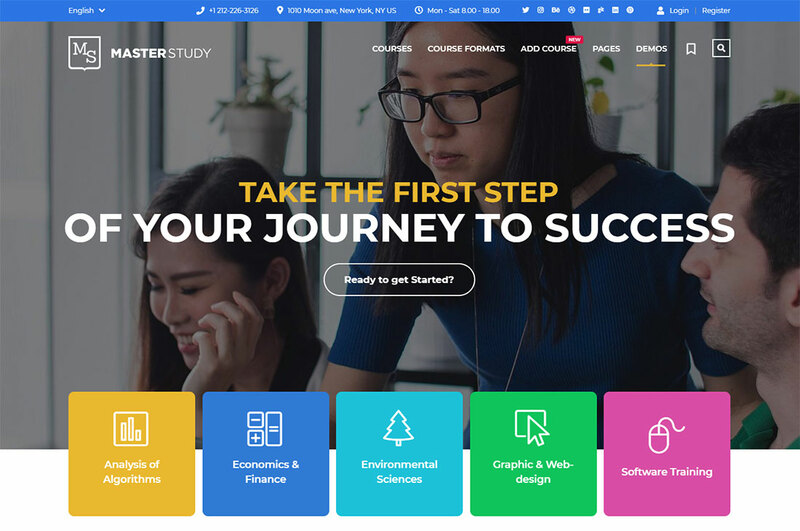 Here’s MasterStudy Education, an LMS WordPress theme for education, eLearning and online courses. With this theme, you can easily manage courses as it uses the learning management system, MasterStudy Pro plugin. There are lots of features you’d surely love when you opt for MasterStudy theme for your site. For selling courses, you have 2 ways to implement payment method. You may use the PayPal and Stripe or the subscription or membership via paid membership pro. With MasterStudy, you can choose how you’re going to disseminate knowledge – whether you do it through videos, text or slideshow. It also features a real-time question and answers feature during the lessons. If you think you need this for your site, click the demo now and see for yourself! Your website represents your business. Therefore, make sure that it can well represent your personality. 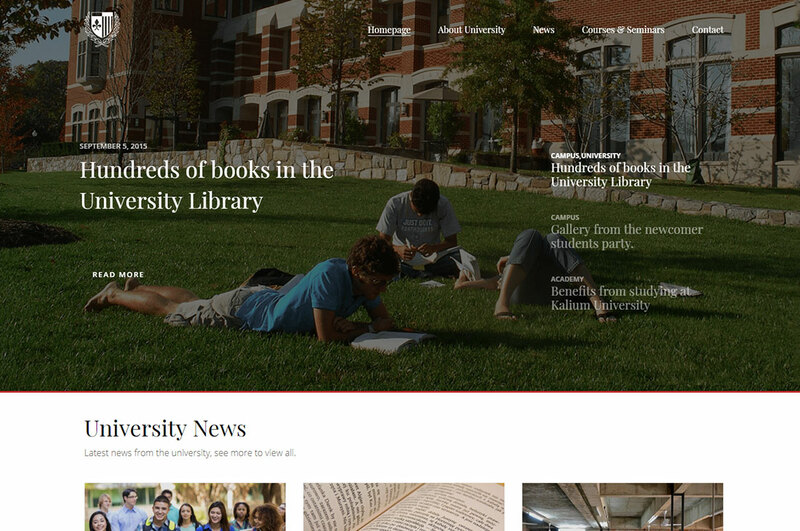 Here’s University, an education WordPress theme with smart and user-friendly designs. It contains 7 ready to use demos for your school website. All of these prebuilt sites is installable in one click. But if you wish to build your own, you may always do without the need for coding. You just drag and drop to finish your layout through the use of the premium Visual Composer. The theme uses plugins that can make management even easier. It uses the LearnDash plugin to provide learning services for higher education and professional training. It’s fully compatible with Event Management where you can create and manage events for your site. It also allows easy management of courses, selling courses, online enrolment, and more. 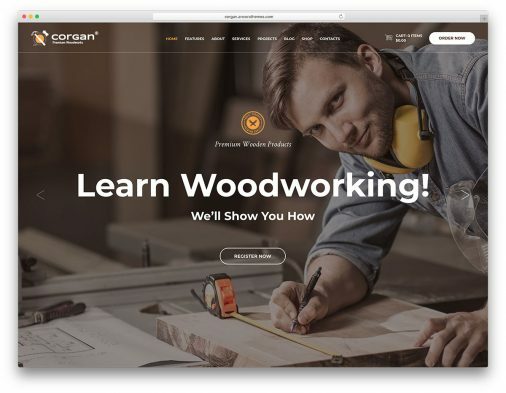 Thanks to WooCommerce plugin that lets you sell courses with ease. Find the best elementary school WordPress themes in this list that we’ve prepared for you. 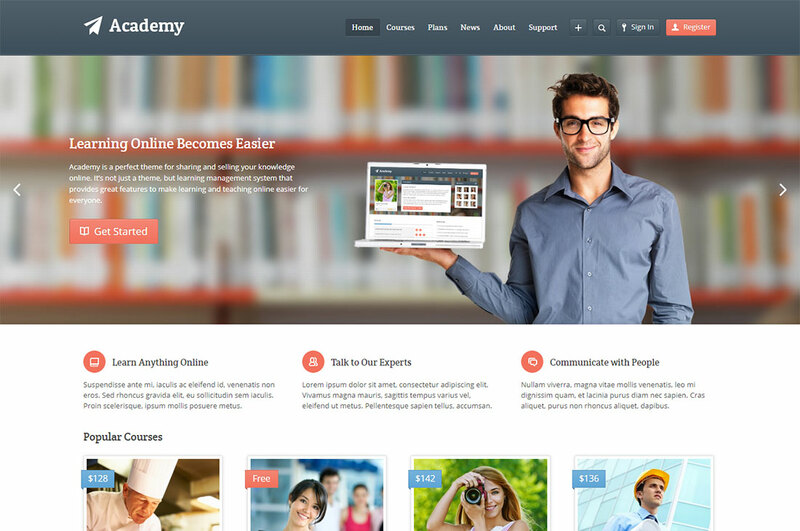 Here’s Academy, a learning management theme that is ideal for teaching and learning lessons online. The theme lets you create online courses, and manage user profiles, add a rating system, embed a question system and more. Apart from that, it also uses WooCommerce for selling courses within your site. Academy is what you need to build a robust, fully functional with a user-friendly interface. With this theme, you can customize the elements to your preferences. As it comes with the theme options panel, editing the colors, fonts, backgrounds, slider settings, creating sidebars, editing contact form fields are just a piece of cake. Check out other amazing features this theme has to offer to your school website! One of the best ways to market your services is to opt for online presence. By building a website that speaks of your personality as a business, you will indeed increase awareness. Total School is one of the ideal elementary school WordPress themes you ought to enjoy. 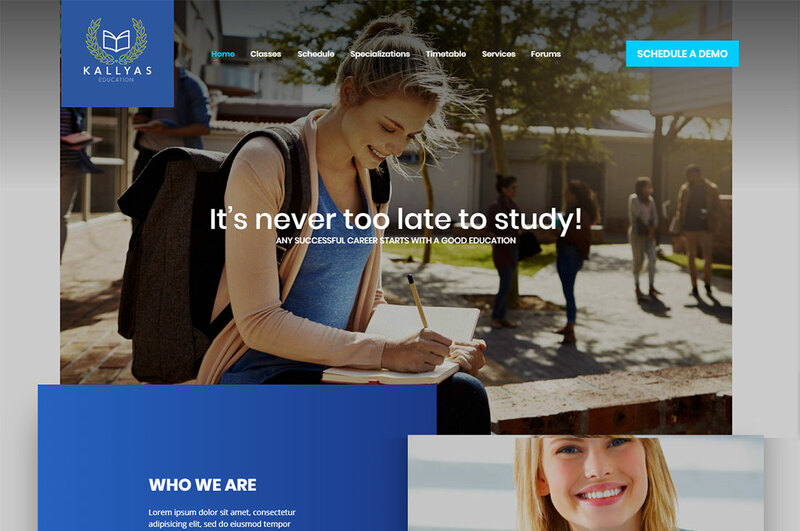 It’s an education WordPress theme ideal for elementary, high school, and similar websites. Total School is loaded with features all ready to provide services to private institutions. It also utilizes the Slider Revolution and Layer Slider for a spotless image presentation using slides. Total School lets you manage events without hassle. The Event Calendar plugin lets you create and manage events. On the other hand, the theme incorporates timetable for scheduling classes, lessons and other activities for students to know ahead of time. Testimonials are also integrated into the theme to give other visitors the reason to check and love your services too. Some of the widgets also work to provide you with outstanding performance such as Twitter, Instagram and Flickr more. With the massive elementary school WordPress themes out in the market these days, you may find it hard to pick the best. But not when you land on this page. Preschool is another awesome theme you need to evaluate for your elementary website. Preschool is a modern and beautiful theme for kindergarten, preschool and junior through to primary school learning centers. The advanced features and functions of Preschool promise success of your education website. It is built to give you the perfect solution for building an online course website, selling online course and also operating an online school as well as an offline school. Preschool lets you create online courses. It has a bright and bubbly color design which you could, of course, adjust if you’re dealing with elementary or primary students. As long as you get your content ready, this theme will do the rest for you. As it lets you drag and drop elements, truly customization has never been this easy. Thanks to the WPBakery Page Builder that make it possible. Preschool comes with 4 homepage demos that are installable in one click. 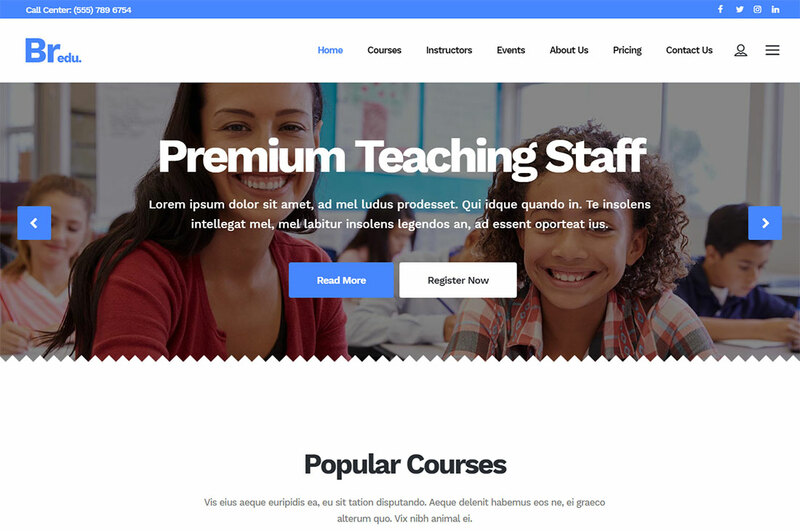 With this theme, setting up a nice and attractive design for classes is much possible.